END 3Q: Gillette 28, Natrona 24. At the end of the third quarter the Camels lead Natrona 28-24. Let's go Camels! Dalton Holst with an interception for the Camels on D. Camels take over to start the 4th quarter. 28-24 Camels lead Natrona. Roo Aten with a 2 yard TD run and the Camels fail on PAT. Camels lead Natrona 34-24 4Q. Host to Pikula for 65 yds, then again for a 3 yard TD. Gillette leads 41-24, 5:31 4Q. Touchdown Camels, Madden Pikula catches a 3 yard TD from Holst. Camels lead Natrona 41-24 with 5+ to go in game. 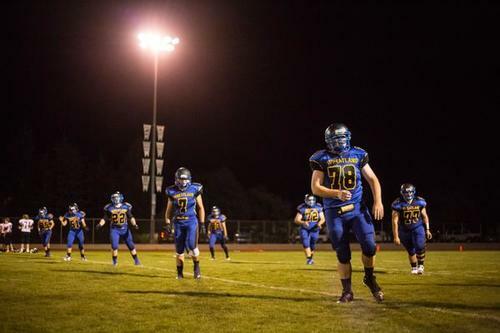 The WyoVarsity Friday Night Recap video will be up in about an hour. Taking nominations for the Week 3 game balls. Final: Lovell 30, Pinedale 27. And, with that... anyone heard anything from Lingle and Mitchell, Neb.? Drayson Hladky with an interception for the Camels.Camels take over with 4 mins to play. Camels 41 Natrona 24. Final score from Casper; Gillette Camels 41 Casper Natrona 24. Jackson just stuffed Rawlins about an inch short on fourth and 2 with 70 seconds to go in Jackson territory... Jackson will hold on to win. Final: Jackson 35, Rawlins 28. For those who didn't already know, @CamelSports top Natrona 41-24. Mustangs first loss in 15 games. First loss to Gillette since 2013. Final score for Kelly Walsh and Cheyenne South? In the Gillette game, radio made it sound like the Defense and Madden Pikula put the wood to Natrona. Pass game went HAM (or had to & did). But just like coach Harshman said last year when Natrona smoked Gillette, I bet both teams get better as the year goes on. Plus the Broncs. Don't forget the really interesting 1A-6 East game tomorrow between NSI and Hulett. Both had big Ws last week. 1p kick in Sheridan. Game balls for the WyoVarsity Friday Night Recap video have been decided! Stay tuned in about 30 min. for our Week 3 recap. Farson's 70-2 victory against Dubois set records for the biggest win (and most points) in Farson history and worst loss in Dubois history. With Natrona's winning streak stopped by Gillette at 15, Wyoming's longest winning streak now belongs to Guernsey at 14. 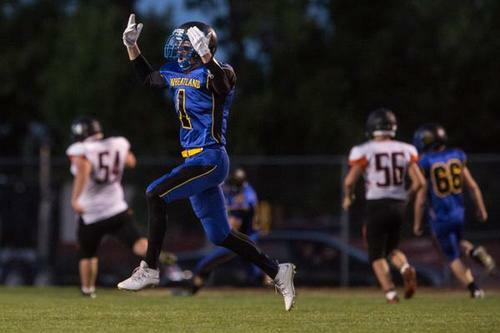 Current record list from @WyomingFootball :Receiving yards in a game, 1. Cody Emrick, 2007, 255 yds. 2. Johnnie Young, Natrona, 2000, 242 .. I talk to @vwilkerson57 in the morning. Have more on the Camels' win in Sunday's @The_News_Record . If you can read this, you can read that.